The GIS-Clusters of Salzburg (Austria) and Northrhine-Westfalia (Germany) have initiated BRIDGE2GEO in the EU FP7 Programme “REGIONS OF KNOWLEDGE” with a kickoff meeting on Feb 29/March 1. The two partner regions will intensify their collaboration in the GIS-sector and develop a plan of action targeting domains such as Renewable Energy, Security, Health, Trade and Tourism. 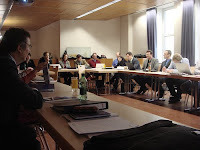 BRIDGE2GEO connects SMEs, research institutes and regional authorities from Salzburg and Northrhine-Westfalia. The overall objective is to strengthen the research potential of European regions, in particular by encouraging and supporting the development of regional “research-driven clusters”. New strategies, communication & business models will be elaborated via the challenging “GIS 2.0 window” to promote implementation of GI-services. Special regard will be given to the European GMES initiative. BRIDGE2GEO will promote synergies between regional and research policies of the two regions. RTD strategies will be integrated into the economic development strategies as a basis for more focused use of the Structural Funds for R&D activities.